We’d love your help. 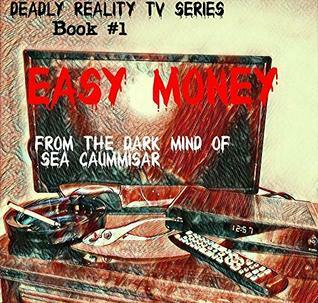 Let us know what’s wrong with this preview of Easy Money by Sea Caummisar. There's a new reality TV game show that pays contestants to hurt themselves. How much pain would you endure to make some quick cash? Would you shoot yourself with a nail gun for $10,000? There are plenty of contestants willing to go on live TV to make a quick buck. Would you watch the show? The ratings are looking good. 'Easy Money' b What would you do to earn 'Easy Money'? To ask other readers questions about Easy Money, please sign up. I am ready for book two in this story. Each time I thought I had seen the worst of Damon he surprised me with something new. If you enjoy a good dose of shock and gore once in a while this story is a good place to go. The scariest part of the whole thing is that the premise of the Reality Show is not that far fetched. It seems like something that could very easily become reality. This is one of those where I would absolutely watch a movie but if this were real life... well, could I stomach it? Would I assume it was just theatrics? How true would it be that people If you desperately needed money, would you go on a reality tv series where you had to hurt yourself in some fashion in order to win some? The challenges get progressively harder but hey, there's medical help for you should you need it and remember, pain only lasts a short time - this money could change your life! I am old enough to remember when the only "reality show" was the nightly news, and maybe The People's Court, Cops, and a slew of talk shows where people mostly complained about their spouses. These days, there are a ton of naked dating shows, surviving the wilderness, and willingness to marry a stranger for a chance to be on TV. So is it really that far fetched to think there could ever be a show where people willingly injure and maim themselves for cash? Probably not, and the author imagines ju I am old enough to remember when the only "reality show" was the nightly news, and maybe The People's Court, Cops, and a slew of talk shows where people mostly complained about their spouses. These days, there are a ton of naked dating shows, surviving the wilderness, and willingness to marry a stranger for a chance to be on TV. So is it really that far fetched to think there could ever be a show where people willingly injure and maim themselves for cash? Probably not, and the author imagines just such a future where people will do anything for cash while a live audience enjoys their pain. "Easy Money" is the brain child of a twisted sadist who may have once been something close to normal but since the death of his only child and dissolution of his marriage, has embraced his darkest desires to see human suffering up close and personal. This was a quick and gruesome read. Yeah. In the world of Reality TV, it ain’t all the glamour, glitz and long-stemmed roses that you might have imagined. There can also be a seedier side to the industry where the sound stages don’t overwhelm their hard-working contestants with ice sculptures scattered with gimme-size bottles of Cinzano, Grey Goose Vodka or Calvados, all on offer inside of opulent makeup rooms staffed with liveried attendants whose sole intent is to convince the contestants that they are indeed the stars that they have become. At least for a brief moment. Okay, he never said anything like that, ever. Welcome instead to the bizarro world of ‘Deadly Reality TV’ where our heroine, the upstanding Mary has recently gotten a job working for the wonderfully named Damon Dahmer. Damon suffers a few little quirks, such as being a total psychopath with a little touch of bipolar that results in violent mood swings ― so basically just your average abusive spanks-snapping producer in the entertainment business. But it does get worse. Damon Dahmer has come up with a new high concept Reality TV programming niche that even Johnny Knoxville’s production company didn’t think of, or wouldn’t touch. I don’t wish to alert anyone to an unintended spoiler so I will just describe this high concept as: contestants get into bidding wars to see which lucky person will be allowed to part with an essential appendage or epidermis layer that they originally received chromosomally from their parents and over the years have become very attached to and would certainly never ever wish to be separated from ― except for the offer of very large sums of money. Originally, when I considered reading this book I saw something referencing the category as ‘horror’, and that gave me pause to self-evaluate if I were really in the mood to get grossed out (when I could just turn on Fox News or CNN and get the same effect). Well, stuff and nonsense, Scarlett. I have survived one of the first mass school shootings, worn khakis drenched other people’s blood , seen beheaded people in Mexico, been stabbed in the right kidney, been shot at, shot back, seen beheaded people in Yugoslavia ― and all that was ‘before’ I even got drafted! Anyway, I survived all the horror ― and actually found that I liked it! Because here is the author’s gift. In her book the TV audience is constantly finding themselves squiggling in their seats wondering: “Why am I watching this? There must be something wrong with me.” And then I finally got the joke. Because I was doing exactly the same thing! But ‘reading’, not watching. The author’s crisp no-nonsense delivery of narrative and knack for seamless nonstop action lulls the senses into believing that, yeah, this could really be happening. Couldn’t it? Damon Dahmer is a psychotic satanist oh and he is a entertainment producer who he has come up with a new Reality TV show. It has a simple concept all the contestants have to do is out bid each other and earn the right to injure themselves for very large sums of money. The author Sea Caummisar has taken an original idea and come up with something spectacular. This reader found herself feeling queasy at the lengths the contestants would go to win money . I don't think there is any amount money of Damon Dahmer is a psychotic satanist oh and he is a entertainment producer who he has come up with a new Reality TV show. It has a simple concept all the contestants have to do is out bid each other and earn the right to injure themselves for very large sums of money. This reader found herself feeling queasy at the lengths the contestants would go to win money . I don't think there is any amount money of that will convince me to my harm self. If you're looking for something new , something different something that will leave you squirming in seat and q really good page turner definitely give this book a try. This is the first book in this series that appears to have very dark humor! What happens when you get a sadist running a reality TV show? The answer – read this book and find out! The author does give a warning that this book is not for the faint of heart, I would take that warning as being serious! Reality TV is a normal part of our every day life these days, people recording horrific events and posting on social media is also a part of everyday life. This book takes it that step further for th This is the first book in this series that appears to have very dark humor! What happens when you get a sadist running a reality TV show? The answer – read this book and find out! The author does give a warning that this book is not for the faint of heart, I would take that warning as being serious! Reality TV is a normal part of our every day life these days, people recording horrific events and posting on social media is also a part of everyday life. This book takes it that step further for the horror and the producer’s personal gratification of seeing people suffer. This is an interesting read, a gory one but interesting non the same! This book is dark, suspenseful. Like the show in the book you couldn't look away. You keep reading because you need to know what's going to happen. You need to know if they will go trough with the contest. It terrified me, yet I loved it. But some parts I felt as if I was reading a book from a sport commentary person who was telling me step by step every play and the person making the play. That in it self was a little upsetting to me. This was both a great beginning to what looks to be an interesting extreme horror series and a darkly funny look at the plague that is reality TV. From a sociopath producer to a simpering assistant to some rather desperate and half crazy contestants, Easy Money is a show destined for greatness. It was enjoyably fast paced even in the backstory chapters. Damon is a character you can't help but love to hate, and I can't wait to see where the series goes next.